Nikon Vision Co., Ltd., a subsidiary of Nikon Corporation, is pleased to announce the release of WX binoculars 7x50 IF and 10x50 IF, featuring a super-wide field of view. Among Nikon binoculars that have been highly acclaimed by enthusiasts of astro, wild bird and nature observation across the world, generation after generation, these models are the most suitable for astronomical observation. The WX binoculars realise a super-wide field of view providing a sharp image to the very edge of the periphery, which redefines the concept of what binoculars can be. They deliver an observation experience that far exceeds anything conventional binoculars can offer. Employing eyepieces with superior optical performance, WX binoculars achieve a super-wide field of view (apparent field of view of 66.6° for WX 7x50 IF, 76.4° for WX 10x50 IF), while their Field Flattener Lens System compensates for a curvature of field across the entire field of view. This means that the sharp image obtained at the centre of the field of view continues all the way to the periphery. As WX binoculars enhance the view of stars at the edge of the periphery that conventional binoculars tend to spread because of aberrations, it's as if you are spacewalking through a starry sky — stars magnificently arrayed before you in all their unblemished beauty. Also, three ED (Extra-low Dispersion) glass elements employed in each tube compensate for chromatic aberration that can cause colour fringing, realising a contrast-rich and high-resolution view. The WX series employs Abbe-Koenig prisms that feature total reflection on all surfaces, and provide a high light transmission rate. High-quality multilayer coating, featuring uniformly high light transmittance across the entire visible range, is also applied to all lenses and prisms to realise a clearer, more natural view. Filter threads on objective lens parts allow a 55mm filter (P=0.75) to be attached. A WX binocular exclusive tripod adaptor TRA-4 and hard case are also supplied, for convenient and comfortable astronomical observation. 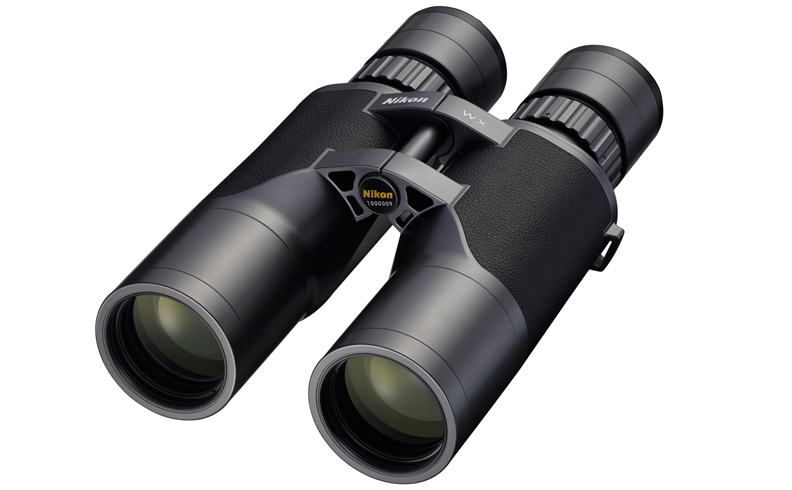 These features combine to ensure that Nikon WX binoculars offer an unparallelled experience in astronomical observation.